With the implosion of my Mets, as they went from first place in the division to not making the playoffs, to the final game for the Nationals at RFK, I don’t think this shot could have been anything but baseball. 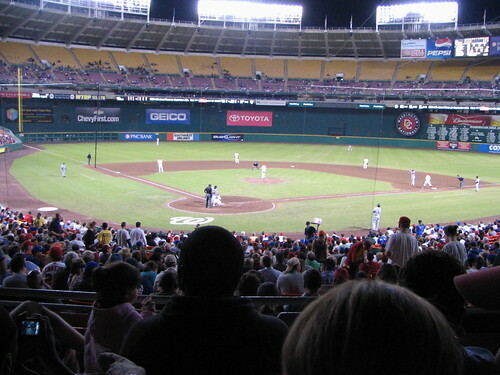 Our final game in our regular seats at RFK was Sept. 19, the concluding game in the last Mets-Nationals series in the stadium. The Mets won handily and all seemed well with the world. Who knew that less than two weeks could make such a terrible difference? Previous entries in this series include August, July, June, May, April, March, February, and January. Category: arts,dc life,sports. There is/are Comments Off on ninth of a dozen. I’m just in sad shape here: Clearly my brain is no longer attached to my body. In my head, I make up a list of beautiful things as the week goes on. Sure, things periodically get forgotten or fall off the list, but not usually the important ones. Yet this week, I’ve missed two. The last was the previous item. The other was that my friend Shelley got an interview request for med school! Shelley has been talking about becoming a doctor since before I moved down to D.C. and has actively taking classes for the last several years. She took the MCAT at the beginning of the summer, struggled through essay writing for months, and two weeks ago hit the submit button on the last of her applications. Getting an interview for med school is kind of like getting a job interview; it doesn’t guarantee you’ll get the job, but it signals that you’re in the running. I’m really excited about this new beautiful part of Shelley’s life. Category: three beautiful things. There is/are Comments Off on bonus bonus beautiful thing: interview. Because my fall allergies have kicked in, my head is full of goo again and I’m not thinking clearly. That is the only reason that in my earlier beautiful things tv beat out a baby. My coworker brought her three year old and her month-old baby in to the office earlier this week. I arrived later than she did, but still got to spend some time with them. Ally showed me her tiny purple Crocs and told me about elephant poop. Jack lay in my arms and held my finger and pooped in his diaper. Category: three beautiful things. There is/are Comments Off on bonus beautiful thing: poop. 1. Heroes began its second season on Monday. It was such a relief to discover that the writers had not slacked off over the summer. 2. The anticipation of the fall tv season is palpable. People ask if you’re planning to watch any premieres and recommend ones they think will be good. And old shows return after time away. Journeyman will live to see a second episode, but Back to You got turned off midshow. We will pull Chuck up on the computer this weekend and Pushing Daisies intrigues. The water cooler gabfest is a lot of fun; feel free to participate around a virtual one in the comments section. 3. I had a grumpy night earlier in the week and couldn’t figure out how to right it. So I pulled out The Ballet Shoes and curled up in the rocking chair when Rudi went to bed. Before I knew it, I’d been sucked simultaneously into 1930s London and into my own second grade year when I first read the story. It’s hard to stay grumpy when that happens. Does anyone have any recommendations for authors I should hear at the National Book Festival this Saturday? Category: books,dc life. There is/are 3 Comments. I wanted to drop you a line to let you know how much I enjoyed spending time with you this year. It may not have seemed like it, because I didn’t seem to get outside as much as I wanted to, but I had fun when we hung out. The harvests from the garden? That was all you. Afternoons at the pool? Terrific! And those Friday nights picnicking in the Sculpture Garden? We’ll be talking about those for weeks to come. When you took off a few weeks ago, I thought you might have headed south for the season. I broke out closed-toe shoes and thicker skirts and a long-sleeve jersey for biking in the evening. We draped a blanket over the bed and turned off the A/C. A few days we even craved soup. But then back you came. Perhaps you thought you were being a bad guest, leaving before you’d said you were going to. It was fine; we appreciated not having to wear jackets to the final baseball games of the season and thought it was nice to spend a few more days together. Sunday, however, Autumn knocked on the door. She asked to come in and I was mortified to have to turn her away. I mean, she had enough luggage for three months! And she likes to travel with jeans and light sweaters and jackets, so her bags are much heavier than your shorts and tanks and gauzy tops and flip flops. I mean, Summer, the community pool has been drained for three weeks now. Apples and pumpkins are crowding out corn on the cob at the farmers’ market. Kids are back in school. Baseball is winding down as teams work to wrap up the pennant races. And, for goodness’ sake, football is several weeks in already! Please, don’t make a scene. Just take your blood-thirsty mosquitoes and your humidity and head over the Equator. I’ve been reading some Australian blogs and it sounds like they’re ready for you to pay them a visit. Don’t take it the wrong way; I’ll be delighted to see you again next Memorial Day. I’ll be eager to visit the Eastern Shore and to swim in the ocean. My sandals and tanks will have had time to rest up and will be ready to dance with you again late into the night. Months of cold and rain will have me yearning to bare my skin to you and to have you bake it golden brown, skin cancer concerns be damned. But you have to leave in order for me to miss you. It’s been a lot of fun. I’m looking forward to the occasional post card and the odd phone call to let me know how you’re faring. In the meantime, know you’ll be in our thoughts.